Motorsport-inspired 2 piece ventilated, grooved rear discs. 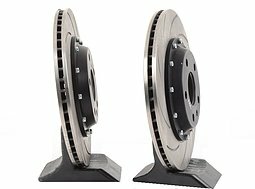 The RacingLine VWR Rear Disc/Rotor Upgrade replaces the original rear ventilated discs with beautifully engineered motorsport-inspired 2 piece ventilated, grooved discs and aluminium bells (or top hats). 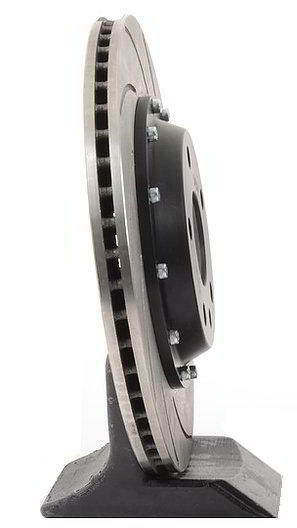 As the dimensions of the original rears are retained (at 310mm x 22mm) this is a simple, direct replacement disc with no other changes needed to rear calipers, pads or mounting hardware. 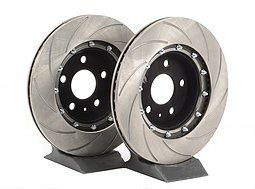 Not only do the replacement rear discs deliver a better resistance to warping under high heat applications, they also give a small reduction in unsprung mass. Very simple fit for all A5-platform (Golf 5/6/Scirocco/S3 8P) and MQB (Golf 7 and S3 8V) cars with the larger ventilated rear discs. Bolt on, and drive! 2-Piece Motorsport-Inspired disc conversion to resist warping. Direct replacement for ventilated rear discs, Retaining original rear calipers. Matched appearance to our front Big Brake Kit whilst replacing rusty hubs on the originals. The ventilated design dissipates heat, while the grooved disc clears gases released from the pads when hot and help to keep that pad surface clean. 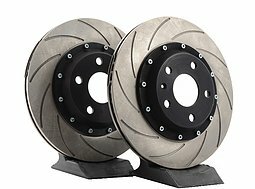 Like all top-end motorsport brake applications, we have selected a two-piece design for our rear discs. Using an aluminium bell (or top hat) bolted to a separate steel disc, the unsprung weight is reduced by around 7%. 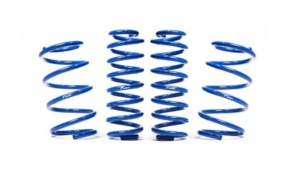 Motorsport-specification, highest quality materials and manufacture in the UK. 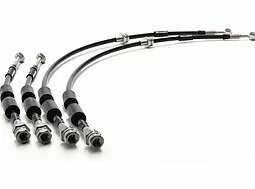 A full set of motorsport braided brake lines are one of the most cost effective upgrades for road and track.